Greg Rucka will sign and discuss Alpha (Mulholland Books; $24.99). Greg Rucka was born in San Francisco and raised on the Central Coast of California, in what is commonly referred to as ‘Steinbeck Country.’ He began his writing career in earnest at the age of 10 by winning a county-wide short-story contest, and hasn’t let up since. He graduated from Vassar College with an A.B. in English, and from the University of Southern California’s Master of Professional Writing program with an M.F.A. He is the author of nearly a dozen novels, six featuring bodyguard Atticus Kodiak, and two featuring Tara Chace, the protagonist of his Queen & Country series. Additionally, he has penned several short-stories, countless comics, and the occasional non-fiction essay. In comics, he has had the opportunity to write stories featuring some of the world’s best-known characters—Superman, Batman, and Wonder Woman—as well as penning several creator-owned properties himself, such as Whiteout and Queen & Country, both published by Oni Press. His work has been optioned several times over, and his services are in high-demand in a variety of creative fields as a story-doctor and creative consultant. Greg resides in Portland, Oregon, with his wife, author Jennifer Van Meter, and his two children. He thinks the biggest problem with the world is that people aren’t paying enough attention. MysteryPeople Presents Greg Rucka speaking & signing Alpha. Retired Delta Force operator, Master Sergeant Jonathan "Jad" Bell, is Wilsonville's lead undercover security officer. The threat begins with the announcement of a hidden dirty bomb, but quickly becomes something far, far worse. 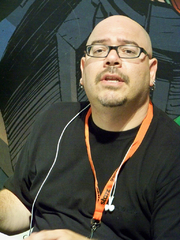 Greg Rucka is the author of nearly a dozen novels, six featuring bodyguard Atticus Kodiak, and two featuring Tara Chace, the protagonist of his Queen & Country series. Additionally, he has penned several short-stories, countless comics, and the occasional non-fiction essay. In comics, he has had the opportunity to write stories featuring some of the world’s best-known characters—Superman, Batman, and Wonder Woman—as well as penning several creator-owned properties himself, such as Whiteout and Queen & Country, both published by Oni Press. His work has been optioned several times over, and his services are in high-demand in a variety of creative fields as a story-doctor and creative consultant. Thank you for supporting Greg Rucka and your local independent bookstore! Greg Rucka reads from Alpha . Greg Rucka signs Walking Dead. Greg Rucka's book Alpha was available from LibraryThing Early Reviewers. Greg Rucka is currently considered a "single author." If one or more works are by a distinct, homonymous authors, go ahead and split the author. Greg Rucka is composed of 7 names. You can examine and separate out names.